I have always admired the First Lady of the United States of America for her poise, intelligence and elegance. But, my respect and admiration for her quadrupled within the last 48 hours. Michelle Obama breath some much needed fresh air into the American presidential race. Her oratory prowess is the stuff of unarguable innate ability and not something learned. It’s obvious! While she must have learnt one or two things from her charismatic husband who is also immensely blessed with the gift of gab, I have no doubt that most of what she displayed on stage must have been naturally bestowed on her. I am one who’s big on oratory prowess. Speak well and you’ll get my attention, but the Michelle Obama masterclass (for that was what it was) on public speaking did more than get my attention. Apart from it being a departure from the bland, uninspiring speeches our leaders subject us to in these climes, it inspired me – It should inspire anyone. And it certainly had me excited. For one, it lend credence to the belief that a speaker is more likely to gain the attention of their audience when they make their speech personal. Right from her opening statement, Mrs Obama took us on a journey…her family’s journey to the White House, her husband’s strength of character, decency and grace. Her children and what they mean to the First Couple. She magnified the seemingly little details, which are in actuality the big things. Everyone loves a good story, especially one they can relate to. The First Lady already had millions of audience around the world wrapped around her little finger with her approach from the beginning of that speech, and from then on there was little she could wrong. In what I personally consider the smartest move by the Michelle and her speechwriter, her speech was hinged on the children of America and the legacy that should be bequeathed to them. Now, even the most cynical people have a soft spot for kids, and so, when you say or do anything that even remotely champions the cause of children, you can hardly go wrong and that’s what Mrs Obama did. Michelle didn’t shy away from expressing the little trepidation she felt about raising two little girls in the brightest spotlight as White House debutantes almost eight years ago. Time and again she reminded her audience about the importance of not compromising the future of millions of American children. The age-old values of decency, kindness, hard work, resilience and togetherness were core features of her speech. Another thing that struck me about the Michelle Obama speech was her willingness to remind everyone about her race as a black person despite her current status. This was emphasised when she referred to her daughters as “intelligent black young women.” She went into history and reminded Americans that the White House was built by slaves. She narrated how she and her husband urged their kids to ignore those who question their father’s citizenship or faith. It was a no-holds-barred speech; about as personal as it could get, and again and again she had the audience on their feet, enraptured in the aptness of her words. Her pride in being black was evident without coming off as confrontational. This is one person who hasn’t forgotten her roots. Very unlike some of her ilk over here who are wont to get distracted by all the trappings of office once they assume the position of power. When she was going to throw a verbal swipe at the opposition, she didn’t do it the trashy way. My article penultimate week talked about the classy way of waving the middle finger, and Mrs Obama demonstrated the model way to do that on Monday. Without mentioning names she urged democrats to shun snide remarks and focus on being the bigger people while knocking Mr Trump and his tendency to make knee-jerk reactions to situations that require more circumspection. Mrs Obama played down on self and made the people of America the focus of her speech. There were many profound and memorable lines in her speech, but in all, she never forgot to sell Hillary Clinton to the people of America – the reason she was on stage in the first place. It was the perfect speech. The speechwriter deserves a generous bonus for their ability to conceive and pen down such powerful words. But, beyond the words she spoke, the First Lady looked the part. Her hair, makeup, dress and even nails were suitable for the occasion. No shimmery dress or distracting heavy lipstick, a simple modest dress, well manicured nails, and of course the charisma of ten men put together. The recipe for the marquee speech was complete. And did anyone notice that her gesticulations were reminiscent of her husband’s each time he gave a speech? It was hard to miss. It supports the popular saying that we are likely to pick up the habits and mannerisms of the people who are closest to us. And who else is closer to a person than their spouse? It’s one more lesson for us all – our partners play a huge role in determining our lot in life, so if you’re a singleton, you might want to choose wisely. 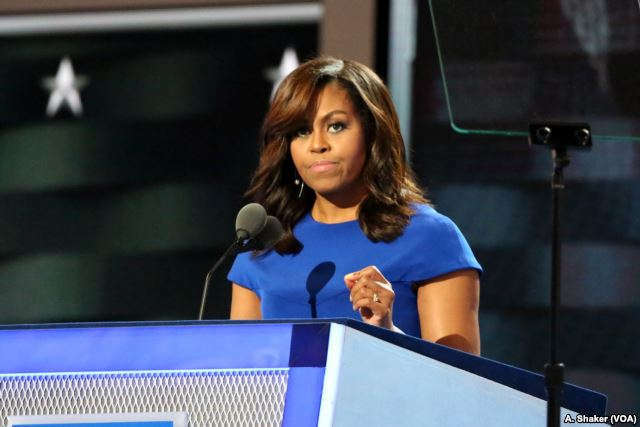 I have read a couple of articles and opinion pieces about the Michelle Obama speech. Not one has given a negative review. As a matter of fact, that speech has been hailed by both admirers and critics of the Obamas and even the opposition camp, with some even touting it as capable of securing the presidency for Hillary Clinton. I believe it’s far too early to tell which way most of the votes would swing in November, as there are many other factors that will come play in the build-up to race to the White House. But one thing is sure, many down the line, people will continue to talk about the brilliance and raw sincerity of perhaps the greatest speech ever given by a First Lady. Well said sis…you, my friend, are a fantastic and inspiring writer!!! You talk about Michelle’s gift of gab, but you unwittingly speak of yourself too. Well done. Awwwwww! This is the sweetest thing anyone’s ever said to me in a while. Thanks so much Ay. God bless you. “Ever classy” you can say that again. That woman oozes class. Thanks for your comments Jesuseun. You’re so right Olamide. She took the high road with the opposition, and honestly I cannot argue about her voicing my thoughts regarding certain life issues. Thanks so much for commenting. All I have to say is that our leaders should take a cue from her if they are humble enough,empty vessels make the loudest noise. You’re right jare. Thanks bro! Nobody has oratory prowess like Barack Obama. I think it was a born gift and nothing to do with his background as a lawyer. I mean this is a man that when he speaks people cry. He just knows how to cajole you with his words that once he speaks, you have a second thought about your hatred for America. I doubt the US would have any president as eloquent as him. In all, one can understand that such gift has been transferred to Michelle and will to the girls when they are much older. Obama is the best when it comes to oratory prowess. The very best. Thanks man. I pray all leading and Future women who wish to be President or First Lady or even Governor’s wife learn, read and become a model after this Woman of History. I also pray that the Men in power can bury their pride and chauvinistic attitude to become teachers of not only good speeches but of captivated success. I pray so too Anthony…I pray so. Happy new month to you too. Thanks a lot.